Further information will be given as soon as it is available. 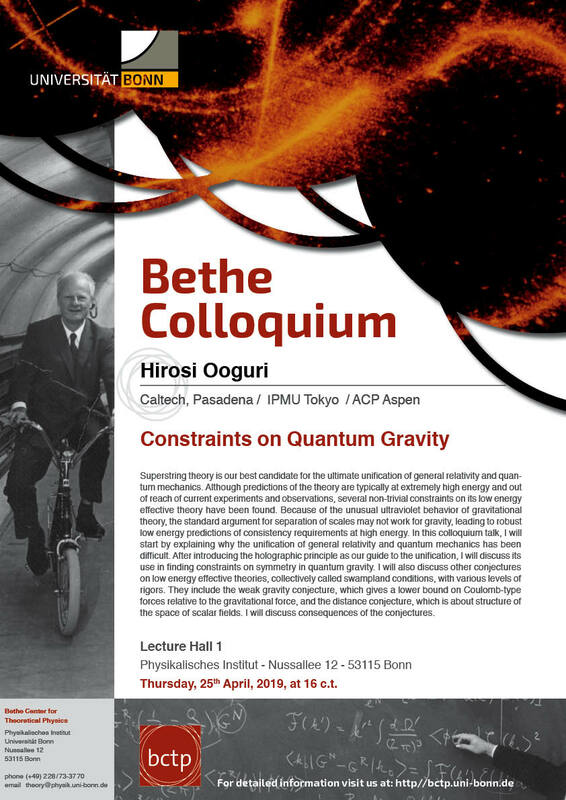 The first Bethe Colloquium in summer term 2019 is scheduled for Thursday, April 25th, 2019, (4:15 pm) in Hörsaal I.
Abstract: Superstring theory is our best candidate for the ultimate unification of general relativity and quantum mechanics. Although predictions of the theory are typically at extremely high energy and out of reach of current experiments and observations, several non-trivial constraints on its low energy effective theory have been found. Because of the unusual ultraviolet behavior of gravitational theory, the standard argument for separation of scales may not work for gravity, leading to robust low energy predictions of consistency requirements at high energy. In this colloquium talk, I will start by explaining why the unification of general relativity and quantum mechanics has been difficult. After introducing the holographic principle as our guide to the unification, I will discuss its use in finding constraints on symmetry in quantum gravity. I will also discuss other conjectures onlow energy effective theories, collectively called swampland conditions, with various levels of rigors. They include the weak gravity conjecture, which gives a lower bound on Coulomb-type forces relative to the gravitational force, and the distance conjecture, which is about structure of the space of scalar fields. I will discuss consequences of the conjectures.